Synopsis: One Life to One Dawn. Review: I was hearing a lot of good things about this one and now I know why. Holy! I could not put this book down as soon as it was in my possession. I don’t even know what else to say before I preface my likes and dislikes. As I write this the second book is on its way to me and I am super excited to continue on. The Characters – I really liked Shazi’s sass and wit and how she was able to keep as calm as she did given her situation. Khalid… ouf. Even though he’s a monster in most eyes it was interesting to see the reason why. The relationship between the two of them kills me. It shouldn’t happen but its just so good. Tariq bothered me. He seemed a little too invested. Despina was a great match for Shazi. The Plot – Was so captivating I loved it. The 1001 nights aspect, mixed with the story telling and the romance. I didn’t really enjoy having the perspectives split because it felt confusing at times but I got over it. Also the last chapter felt oddly placed. Like an abrupt ending… but that letter though. The World – This was my only qualm. Why was there magic in it? It seemed like it was thrown in there with no explanation. I want to know why! The Cover – The hardcover covers are so pretty. I have the paperback one in my possession that is okay but does not even compare to the hardcover. I will have to pick it up for my collection and to match with the sequel. 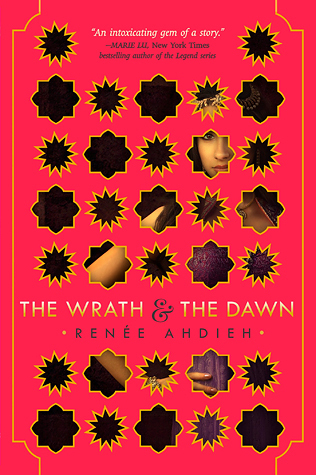 This entry was posted in book review, renee ahdieh, the wrath and the dawn. Bookmark the permalink.